Context: read this as the first of 6 novels over 6 days off for Eid Al-Adha. I’ve read a fair few books from South Africa that deal (unsurprisingly) with the issue of relationships between the black and white communities. 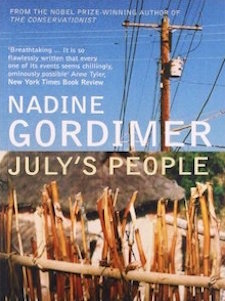 Nadine Gordimer’s novel is, sadly, not the best I’ve read and that’s a shame because I thought, for a moment at the start, that it would really be spectacular. Unlike Roth’s Human Stain, Gordimer here deals with race using the clarity we are used to. The whites are white and the blacks are black. Her particular twist though is that the blacks have just overthrown the white South African apartheid government and have driven the Smales family, one particular white couple with their three children, deep into the bush. They take refuge in the village of their “house boy” July who guides their yellow pickup (known locally as a bakkie) many hundreds of kilometres to safety. The scene is thus set for all that you’d expect with reversed roles, complex miscommunications and cultural confusion that affects each one of the family and villagers in different ways. That’s ambitious and to pull it off in less than 200 pages you’d have to be a Nobel Prize winner. 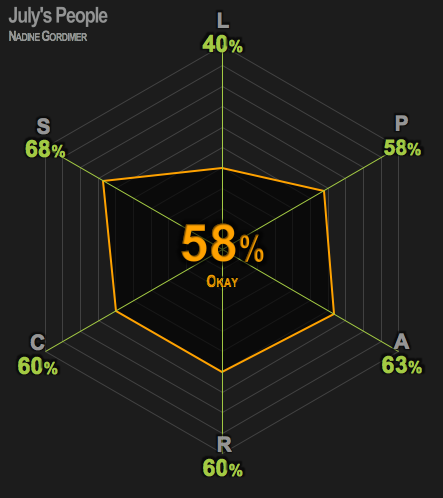 Thankfully, Gordimer is just that. Unfortunately, I don’t think she makes it. Another 100 pages or perhaps 200 pages of more lucid prose would perhaps have done it. The prose here is definitely inventive. The trouble is that it makes it hard to understand what’s going on. Gordimer is yet another author whose keyboard lacks a quote key, and she insists on putting conversation slap bang in the middle of description. The wife and I initially started this as one of the books we read aloud to each other. That idea didn’t last long. So, while you’re dealing with the prose, you’re distracted from what you should be focussing on which is the fact that slowly and surely, the Smales family are losing their bearings. This is fascinating and I so, so wanted more of it. I wanted more of the tense, terse exchanges between the spouses, more of their confounded attempts to continue to raise their children their way and, especially, I wanted more of the renegotiated relationship with July. Gordimer does deal with all of this, but it is sparse. There are incidents which could have been played out in so much more depth and, when the ending comes, it is abrupt and unsatisfying. I think there’s just about enough here to push the debate further, and that’s probably why the book was banned until the South African regime fell. I wonder though if at the time she was playing safe in an attempt for her work to reach a wider audience. If so, it didn’t go far enough either way. You like to have some cup of tea?